Physical description:The male Chameleon is slightly larger than the female, reaching up to 23.5 inches in length and exhibits a pair of blunt nasal horns on its snout. They have bulging eyes which allow them to see up to 360 degrees around them. They have unusual body shapes with rough skin and fascinating color changes. 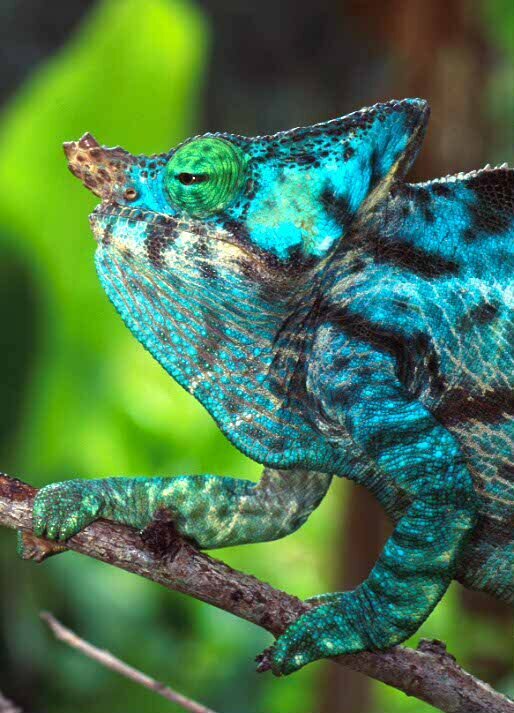 General information: The scientific name for the Parsons Chameleon is "Chamaeleo parsonii". True chameleons are members of the Old world Family Chamaeleonidae. There has been a great deal of discussion about the classification systems for the chameleons and there is no current model that is universally accepted.Chameleons are nonvenomous and primairly survive by eating small as well as large insects, and even small vertebrates. In captivity the chameleons' diet consists of large adult crickets and waxworms, usually called grubs. Chameleons live high in trees and are rarely ever on the ground. Their feet are designed for grabbing branches, therefore making them very clumsy and easily caught and eaten by awaiting predators if ever on the ground. Reproduction occurs once every two years, and the female produces 20 to 25 eggs per clutch. Incubation for this species takes longer than a year. As with other chameleons, once the babies are hatched from the amnionic egg, they are on their own. The parsons chameleon is one of four giant chameleon species, it ranks as the heaviest and possibly the largest of all the chameleon species. Temperatures in their environment are very mild, ranging from around 65 degrees F. at night to 85 degrees F. during the day. The life span is around seven years. 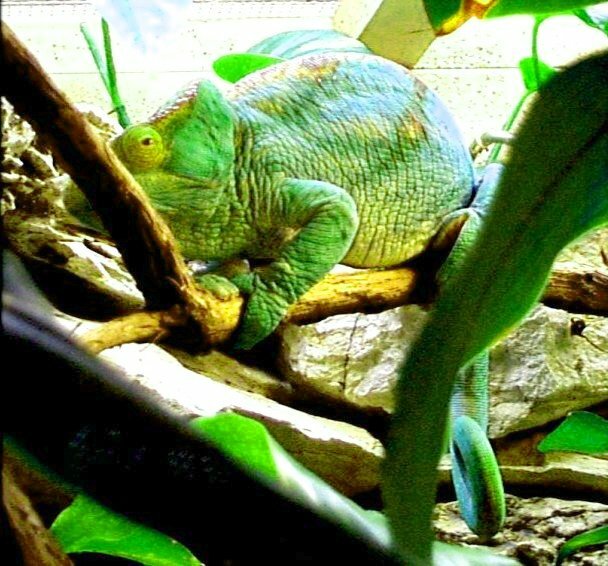 The Fort Worth Zoo proudly holds the record for the longest kept chameleon in captivity, it lived up to four years. Special anatomical, physiological or behavioral adaptations: Chameleons have adapted the ability to change color for many reasons such as to regulate body temperature, communicate with other chameleons, and camouflage themselves against predators in their natural habitat. Their tongues can extend 1.5 times the length of their body, this allows them to grab food they otherwise would not be able to reach. Their globular, independent eyes help them to scan the area around them up to 360 degrees without having to move their heads. 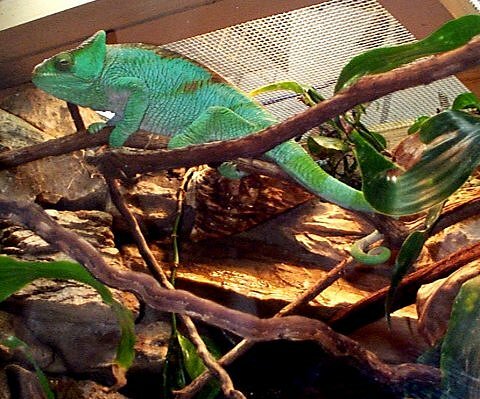 The chameleons feet are designed to grasp and hold branches. And last but certainly not least, the chameleons have developed the ability to drink water from licking the dew and rain droplets off of leaves. The drip system is the most common form of chameleon watering system. While in captivity at the Fort Worth Zoo, the zoo-keepers frequently mist the inside of the chameleon cage, keeping the leaves damp. Comments and observations related to the Chameleon of the Fort Worth Zoo. The chameleon has the ability to change color at any time in order to camouflage themselves aginst their predators in any environment, and to help regulate their body temperature, as reported above. The chameleon fascinates me more than any other reptile species due to the range of adaptations it has acquired for survival. There's not much movement from the animal, therefore its behavioral activity is difficult to observe. New classification systems are being designed upon the basis of lung structure, squamation, hemipenes, and other morphological structures. Latest research has discovered that chameleons are very delicate reptiles, therefore usually die while in captivity. They require extensive housing, special vitamin and mineral supplementation, exposure to UV lighting, a varied diet, and unusual watering in order to thrive in captivity. Since the UV output of most human-made full-spectrum lights do not provide the same UV exposure as the sun, additional supplementation is ESSENTIAL. Fort Worth Zoo public display information, and employee interview.